PPlease note that a patterns of "background" bands may be present, this varies from tissue to tissue. , corresponding to N terminal amino acids 29-44 of Human RGS2. Our Abpromise guarantee covers the use of ab9963 in the following tested applications. WB 1/10000 - 1/15000. Predicted molecular weight: 25 kDa. Publishing research using ab9963? Please let us know so that we can cite the reference in this datasheet. Thank you for contacting us. I am sorry to hear that the antibody is giving you problems. As we discussed over the phone, potential troubleshooting tips that could help improve your results are: 1) loading more protein per lane (up to 100 ug max) 2) using more primary antibody (e.g. 1/1000) Please let me know if these tips were helpful or not. If they were not of help, I'd be happy to discuss a replacement, credit or refund with you. I wish you good luck and look forward to hear back from you! I am seeing two strong bands, one at 25kda and a darker band at 12kda. I work on the VTA area of the brain. Changing blocking has not removed the smaller band. Thank you for taking the time to submit these concerns to me. If there are only two bands on the blot and background this problem may be due in part to target breakdown or standard cross reactivity due to the fact that the product is a pAb. Since pAbs recognises multiple epitopes it could be the Ab pulling out an alternate target from your sample. You mention in the data forwarded that you have employed inhibitor cocktails. To prevent breakdown I would also advise that all sample preparation is carried out on ice, including mechanical homogenisation. If you are still concerned then you could locate a commercially available brain lysate which may suggest whether additional band is a peculiarity of brain sample. I would also like to advise that you run a no primary control in order to ascertain whether the band that you are seeing is due to the non specific binding of the secondary Ab rather than the primary. BATCH NUMBER 270602 ORDER NUMBER 05154 DESCRIPTION OF THE PROBLEM Using your suggestions the background was reduced but bands of a higher molecular weight were all that we could detect. SAMPLE Whole cell lysate of a 3T3 derived cell line shown to express the RNA PRIMARY ANTIBODY 1:2000 in PBST with no milk O/N at 4oC as suggested Previous blot: 1:2000 O/n 4oC with milk DETECTION METHOD ECL POSITIVE AND NEGATIVE CONTROLS USED We are running these blots blind as we lack a good positive (or negative ) control in the murine system. We are trying to get hold of human buffy coat PBMCs which are reported to express high levels of RGS2 but are still working on this. ANTIBODY STORAGE CONDITIONS overnight at 4oC. Following day aliquot and store in 5ul volumes at -20oC SAMPLE PREPARATION Sample prepared according to Marais et al., 1993. Proein estimation by Biorad reagent. Aliquot 30ug in 1X SB (120mM TRIS pH6.8; 20% glycerol;5% SDS and B-EtSH. Heat 5min at 95oC before loading. AMOUNT OF PROTEIN LOADED 30-50ug ELECTROPHORESIS/GEL CONDITIONS 12% PAGE/SDS gel TRANSFER AND BLOCKING CONDITIONS Electro blot Tris/Glycine/SDS with 20% MtOH (Dry Blot Buffer) for 2hrs at 20V. Blotting was successful as determined by the blot samples run in duplicate and the other half of the blot successfully probed with anti p27. Blocked as you suggested for 30min in PBST/5% milk. In the blot that had more background and putative band at the right size we blocked O/N in this mix. SECONDARY ANTIBODY Dako secondary anti rabbit - HRP diluted 1:3000 PBST no milk 1hr RT as suggested. Previous blot as above but with milk HOW MANY TIMES HAVE YOU TRIED THE APPLICATION? 3 DO YOU OBTAIN THE SAME RESULTS EVERY TIME? No WHAT STEPS HAVE YOU ALTERED? Forst - I did the blot our way with the recommended concentration of RGS2 (1:10000) and got a completely negative blot. Then I increased the cell lysate to 50ug/track and tried 1:2000 dilution of RGS2 and got the blot with bands but very high background. I then contacted you and redid the blot exactly as you suggested (with 1:2000 RGS2)and on this occasion got less background, and multiple bands that were too high for RGS2. ADDITIONAL NOTES Will send scanned images to follow but our scanner isn't networked this morning. Thank you for your patience. The originator of the antibody has never looked at 3T3 cells (which are fibroblasts), but at the RNA level RGS2 is most highly expressed in brain. In 3T3 cells, RGS2 mRNA may be low, or the protein may be unstable. The latter possibility is likely in view of Varshavsky's article, mentioned to me by the originator, in Science last year that described the regulation of RGS2 degradation. 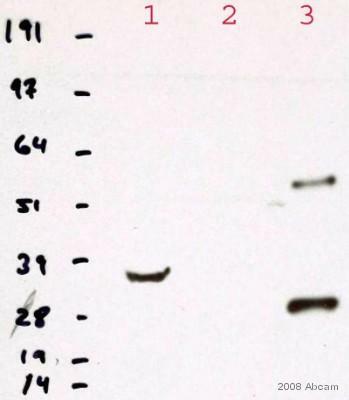 Although the originator of the antibody did not recall which RGS2 antibodies were used in this paper, the methods described therein as well as the paper itself could be excellent help for you. I believe you should use a brain lysate as a positive control. It is possible that the protein level in 3T3 cells is below detection. Thank you for your phone call. I'm sending you a free of charge replacement for ab9963, for your record it is on order# 50879 and you should receive it Tuesday. The vial is from lot 27062 but I checked it and it is fine. Please let me know if you have any more questions and I do apologize for the inconvenience. Customer would like to know if ab9963 has been tested with native protein. Thank you for your enquiry. Ab9963 has been tested only against transfected or purified recombinant RGS2. If you have any more questions, please contact us again. Customer is using ab9963 in WB on human samples. Is getting lots of background and is getting two bands in the predicted size range of 25-30 kDa. Thank you for your patience. Unfortunately I still have not heard from the originator of this antibody regarding your questions about the multiple bands. As for the background that you are experiencing, high background is usually a sign for blocking problem. You may want to try blocking with 3% BSA rather than milk. Also, the secondary may be reacting with the blocking reagent. I suggest that you test this by omitting the primary antibody and testing with only the secondary. If background appears, change either the secondary or the blocking reagent. Also, please try using the secondary at a lower concentration. Your technical sheet says that this antibody was tested in Wetern blots...in those tests, did the sera recoginze a band of the predicted size and, if so, were there any other non-specific bands also seen? Were these tested in cells/tisues or agaisnt pure protein? If cells, which one(s). Were there any controls done to block the staining (e.g. peptide preabsorption?). I really, really, really want to buy this sera (as would many others), but I'm not going to waste money on something that does not work. I need a sera that recognizes RGS2 in cell lysates.....convince me that I should buy your product. Thank you for your enquiry and your interest in our products. All the information available for this product is listed on the on-line datasheet (price, datasheet, publication, suitability, cross-reactivity). Our policy at Abcam is that if an antibody does not work as specified on the datasheet, we will offer a replacement or reimbursement. Can you provide any technical data showing that your antisera recognizes native RGS2 expressed in cells/tissues by western blots and by immunocytochemistry? What controls do you have to show that the bands recognized by the sera in cell lysates is in fact RGS2?